The hazards potholes create are well-known to motorists and cyclists; damage to your car or bike and an uncomfortable or dangerous ride. More worrying is potholes have resulted in serious injury or death of almost 400 cyclists over the past ten years. Now, the results of two surveys show the sheer scale of the pothole issue we have on our roads. The Asphalt Industry Alliance (AIA) and Kwik Fit each published findings which, together, highlight both the condition of — and the harm caused by — the state of our road surfaces. The AIA’s Annual Local Authority Road Maintenance (ALARM) survey shows that pothole repairs in England and Wales rose by 330,000 in 2018 to a staggering 1.86million. In fact, councils are fixing a pothole every 17 seconds with last year’s freezing weather much to blame for the decline of the roads. But there’s hope for improvement as the Department for Transport gives councils over £200million for road repairs, to fix over 1,000 miles of highway — with £50million reserved for potholes and flood measures. Research into advanced surface materials and reconstruction techniques will continue, such as an asphalt three-dimensional printer researchers at University College London designed to repair road cracks and potholes. Over six million vehicles suffered damage from potholes with an average garage bill of £108.60 but the ALARM survey shows that motorists in England and Wales have only received £13.5million in compensation—just 2.1% of the total loss. 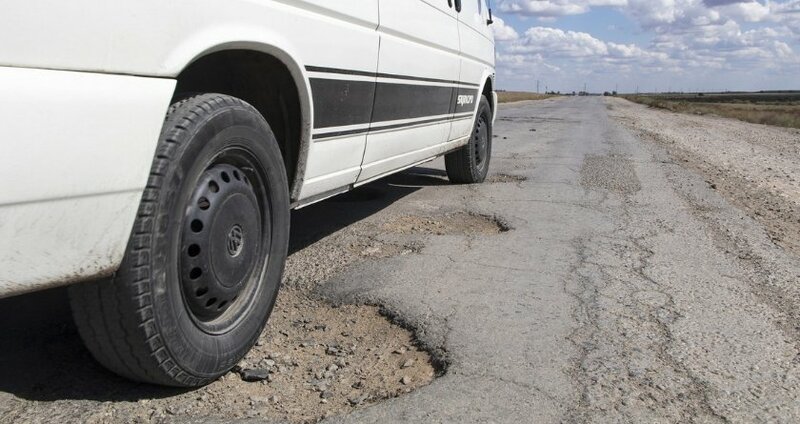 Kwik Fit’s study on potholes showed that the number of us affected in 2018 increased by 2.9 million to over 11 million. The most common damage is to a vehicle’s steering, suspension, and wheels. In the last twelve months, 31% of motorists who hit a pothole said they thought it was a puddle because water hid it, 46% said they risked colliding with other traffic if they had swerved around the pothole and 4% admitted they hit a pothole because they were speeding. Mr Grayling has launched a consultation on increasing the guarantee on utility firms’ roadworks so that if a pothole forms within five years, the company must bring the road surface back to normal. “Road surfaces can be made worse by utility companies, so imposing higher standards on repairs will help keep roads pothole-free for longer,” said the Transport Secretary. Last year the AIA claimed it would cost £1.5billion more in funding each year, for the next 10 years, for repairs on local roads to reach a condition whereby they would be cost-effective to manage. “It is encouraging that those in control of the purse strings seem to have recognised the value that additional expenditure on roads can deliver. But it’s clear from the 29% increase in the number of potholes filled in England … that much of this has been used for patch and mend [work]. “This doesn’t provide value for money, nor will it improve the underlying structure and resilience of our roads,” he said. Check your tyres are at the recommended air pressure because if they’re under or over-inflated, your car is more likely to sustain pothole damage. Consider winter tyres if you live in an area affected by lots of potholes. The sides of the tyres are often a little larger, and able to absorb the impact that driving into a pothole can cause. Rain pools in potholes so try to avoid puddles where you can. Drive with caution if dodging a puddle isn’t possible. Reduce your speed if you’re on a bumpy stretch of road. The faster you’re driving when you hit a pothole, the more damage you should expect. Potholes can sometimes cause drivers to lose control of their vehicle, so keep your hands at the ‘ten to two’ position on the wheel to stay in command of your car. If you hit a pothole, stop in a safe place and assess the damage as soon as possible. Sometimes pothole damage won’t appear obvious straight away, so keep checking your tyres and wheels in the days afterwards. Get the vehicle checked out at your first opportunity if you think your car has suffered damage. Do your bit by reporting potholes; don’t assume others have reported them and if you want to make a claim, this website will tell you all you need to know. What condition are the roads where you drive or ride? Have they damaged your bike or car? Have poor roads caused you an injury? Tell us in the comments. Ray is spot on; we see the same here in Glos. The companies charged with maintaining roads have a vested interest in making shoddy repairs. I would pay 50% on completion with the balance after 12 months, but only if the repair holds good. Give them a fighting chance Charles…. lets say 2 weeks…. I have seen repairs fall apart within this timescale. Indeed, I used to work as a project manager and always used to insist that contractors provided an insurance backed guarantee to cover any premature failure of their work. Cost more but cheaper in the rhe long run. Local councils should be forced to do the same to ensure value for the taxpayer. Where I live in a London borough, potholes have just been patched and the contractors left holes against the repaired ones. Sent the photos to the council, they were not interested. Someones making loads of money. The services companies do a temporary repair and then pay Councils huge sums to do the job properly. A large part of the problem is out-sourcing of the work. When councils did it with in house staff they had a vested interest in doing a good job that would last longer. Companies to whom the work is out-sourced have a vested interest in doing it just well enough to last to the next financial year. In my County they are boasting they have £20m extra for potholes over next 2 years from Government. Unfortunately, they’ve been getting £100m per year for the past 5 years. So in fact, the new funding is HALF what they’ve been getting. Even more is that they have hardly made any impact on the shedule of potholes for repair; they are reported quicker than they are repaired! 38 Billion pounds taken in road tax annually. Is it really value for money considering how much is spent on repairing destructive Road surfaces? There is no such thing as road tax, and hasn’t been for decades. What we pay is vehicle excise duty, otherwise known as car tax, simply a tax that allows you to have your car on the road. Abe, your the problem with this country, you should be an MP. It’s not road tax, it’s a tax that allows you to have a car on the road! Classic. It’s not income tax, its money government take off your income every week! No it’s a tax to pay for everything except roads. Road Tax hasn’t existed for Years. Its now cleverly called Vehicle Excise Duty. Therefore, we cant claim 38 Billion should be spent on repairing roads. I agree that incompetent repairing of potholes, or just one of the three very close by as ‘that’s all my job sheet authorises’ is ridiculous. The council should check the,quality of the work and if the hole is back within six months, get the contractors back, as no cost to the council. I wonder if a Freedom of Info request to all insurers would show how many near misses and accidents are now caused as we constantly have to look out for potholes, defective road surfaces etc rather than other road users? Here in Rochdale its on record one of our councillors (Who by the way gave themselves a 34% rise in expenses) openly stated if you dont vote for “labour” then you dont get your pot holes fixed… So if we dont vote for a labour council, the roads go unrepaired.. if we do vote for a labour council, the roads still go unrepaired anyway!!! Under labour our roads are worse. Our borough has gone down hill fast. Councils need to be educated on how to repair potholes correctly. They do not cut out the affected area, they do not put tar into the base of the repair and then they pat the new tarmac down with a shovel or a weighted stick.What a waste of time and money. Most of the rural roads in my part of the world (East Anglia) are showing signs of complete structural failure. The potholes that result can be filled and patched until kingdom come but they will reappear after a year or two. These roads need full-depth reconstruction and Mr Grayling’s £200m could be spent in my county alone and still fall short. Non-trunk road highway maintenance budgets have been cut for over 4 decades or more as they are easy targets. Only now are the disastrous consequences becoming evident. Continuing National disgrace with lethal possibilities . Unnoticed pothole damage could cause your tire to fail when driving at speed on a motorway. Pot Luck, eh? No such thing in Staffordshire where many roads are simply awash with potholes, including some close to my home that have remained unrepaired for over 12 months. And Grayling is a joke (a costly one to tax payers too!). Will the money be spent on repairing potholes and will the be mended so that thy do not appear again after a short time ? I just wonder ! Don’t try to stop assess any damage after each pothole when driving in Cornwall, too dangerous to stop! Don’t stop after hitting a pothole in Cornwall, the roads are too dangerous to stop. Re; pot hole repairs, disinterestead, pooly supervised workmen, low grade materials, unsuitable lightweight plant. HYes! repairs are sub-standard. A potho;le on a tee junction close to me was repaired twice in 12 months and is a deep hole again. Surely they could learn from the crews who repair airport landing strips between landings. I agree with the comment about airport landing strips. I watched part of a documentary showing how a team can lay 3 lots/depths of tarmac over a100 yard length in one night and it be ready to take the weight of an aircraft by morning. It would surely be cheaper in the long run to use these techniques and/or quality of tarmac to resurface longer stretches of road rather than make do and mend.. Yes a road may need to be closed to enable this to be done but this is a small price to pay for a quality repair. That Somersham road … Sine wave. Arthur, your right but they don’t do that right either, here in Leyland they have done longmenygate for first mile or so full properly done job, last 2 mile total bodge job of large patches, one of um is about 300 yrds long full road, then has a old bit of road size of a car in the middle! Wtf, not saved nothing, machine and men are there, only needed another 50 quid of tarmac for a proper job. Bodge it an scarper, spend a quid to save a penny. If the councils use the money for that . . .
Pumping money into pot holes won’t help; folk will just stop and steal it all, or else the rain will wash out the notes. What a daft idea..
”Consider winter tyres” Winter tyres wear out at an alarming rate at temperatures above 7 degrees, and they also are much more expensive than ‘ordinary’ tyres. So it would cost a fortune to uses them all year round. Perhaps you mean ‘all season’ tyres? How much of our Road Tax is spent on upkeep of our roads? Police say our cars must be roadworthy, thats a joke. I have had to replace 3 broken springs in the last 12 months, in all my years of driving (50 years) I have never had to replace a broken spring. Never mind filling holes resurface the roads with our hard earned cash.